Many a post Christmas lunch slump has been saved by Monopoly. It's the ultimate Londonist game playing diversion, as long as it's the traditional London one, rather than some other maverick imposter version. This year, however, we're excited to embrace something new - the London Underground edition! Just look at that board, criss crossed with tube lines and speckled with roundels! It's just hit the top of our Christmas list - in fact, we might just buy it for ourselves, straight away as we're besotted. We don't yet know if the playing pieces have been changed from top hat, dog, car etc to busker, rat and blue bedecked LU customer service perkin but we just can't wait to find out. Get your hands on this gem from the London Transport Museum shop for just £24.99 or buy online. London Transport Museum is perched on one corner of Covent Garden Piazza. The Museum (brilliant) has an admission fee but you can browse the shop for nowt (interesting in itself). 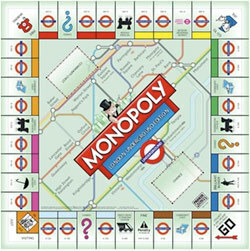 LTM has loads of gifts for London transport geeks as well as presents for more well adjusted people too. Have a look.